For the convention center Anhembi Parque, see Anhembi Convention Center. 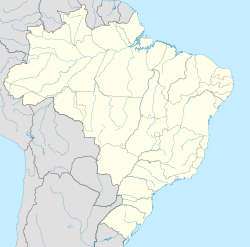 Anhembi is a Brazilian municipality in the state of São Paulo. The population is 6,307 (2015 est.) in an area of 737 km². The municipality contains the 293 hectares (720 acres) Barreiro Rico Ecological Station, created in 2006 to protect an area of Atlantic Forest and its primate population. This page was last edited on 24 January 2017, at 02:20 (UTC).